Clownfish, or Clown Anemonefish, are known as bright orange fish with three vertical white stripes or bars down their sides. They were first made famous as the lead characters in the Disney Pixar movie Finding Nemo. There are actually 28 different types or species of anenomefish. Some exhibit different coloring including a pinkish with a single white stripe and some have large sections that are black. Typical size for the clownfish is 4 to 5 inches long. The Clown anenomefish can be found in the warm shallow waters of the Southwest Pacific Ocean, the Red Sea, and the Indian Ocean. Like in the movie Finding Nemo, they live in the Great Barrier Reef. They get their name because they have a very close relationship with the anemone. The Anemone is a plant like creature with lots of poisonous tentacles that lives on rocks or coral in the ocean. The clownfish has a special layer of mucus on its skin that protects it from the anemone's poison. By living in and around the anemone, the clownfish gets protection from predators and also gets to eat scraps from the anemone's food. The clownfish, in turn, keeps the anemone clean by eating and removing parasites. Despite their close relationship with the anemone, clownfish do still live in groups called schools. Within each group is a dominant female leader. Oddly enough, all clownfish are born male. If the female leader dies, the largest and strongest male will become a female and the new leader of the school. Many clownfish are bred and raised in tanks for sale in the US. If the aquarium has an anemone, they will sometimes live in the anemone, but not always. They don't need an anemone to survive in an aquarium. They can live around 3 to 5 years. Once a male clownfish becomes female, there is no going back. It will then always be female. 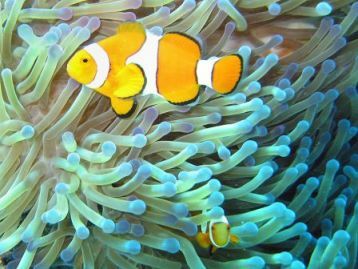 The scientific term for the relationship that the clownfish has with the anemone is called symbiotic mutualism. They get their name from their bright orange coloring and white stripes, but also from the bouncy way they swim. Clownfish females can lay over 1000 eggs. The male clownfish guards the eggs.